Rep. Ilhan Omar, D-Minn., apologized for comments on social media widely condemned as anti-Semitic. House Democratic leaders called the remarks "deeply offensive." One of the two first Muslim women to serve in Congress has apologized for comments on social media widely condemned as anti-Semitic. Rep. Ilhan Omar, D-Minn., said she apologized "unequivocally" following a joint statement released by House Democratic leaders calling on her to do so. "Anti-Semitism is real," Omar tweeted Monday afternoon, "and I am grateful for Jewish allies and colleagues who are educating me on the painful history of anti-Semitic tropes." She added, "We have to always be willing to step back and think through criticism, just as I expect people to hear me when others attack me for my identity. This is why I unequivocally apologize." Omar questioned the financial relationship between AIPAC, the powerful pro-Israel lobby, and members of Congress in tweets over the weekend. In her apology, Omar added that she still believes there is a "problematic role" for lobbyists, whether it's AIPAC or the NRA. The House leaders' statement, led by Speaker Nancy Pelosi, D-Calif., called the tweets "deeply offensive." "We are and will always be strong supporters of Israel in Congress because we understand that our support is based on shared values and strategic interests. Legitimate criticism of Israel's policies is protected by the values of free speech and democratic debate that the United States and Israel share. But Congresswoman Omar's use of anti-Semitic tropes and prejudicial accusations about Israel's supporters is deeply offensive. We condemn these remarks and we call upon Congresswoman Omar to immediately apologize for these hurtful comments." The statement was issued jointly with Majority Leader Steny Hoyer, Majority Whip James Clyburn, Assistant Speaker Ben Ray Luján, Caucus Chairman Hakeem Jeffries and Caucus Vice Chairwoman Katherine Clark. The leadership statement came after two Jewish House Democrats began circulating a letter Monday to their colleagues asking them to join in asking party leadership to condemn anti-Semitism citing "recent rhetoric from certain members within our Caucus." The letter, by Reps. Josh Gottheimer of New Jersey and Elaine Luria of Virginia, does not name lawmakers but is clearly a reference to freshman Rep. Ilhan Omar, D-Minn., who is the target of recent criticism from both the left and the right for comments seen as both overtly and subtly anti-Semitic. Meanwhile, Minority Leader Kevin McCarthy, R-Calif., said in a statement that the GOP will "take action this week to ensure the House speaks out against this hatred and stands with Israel and the Jewish people." 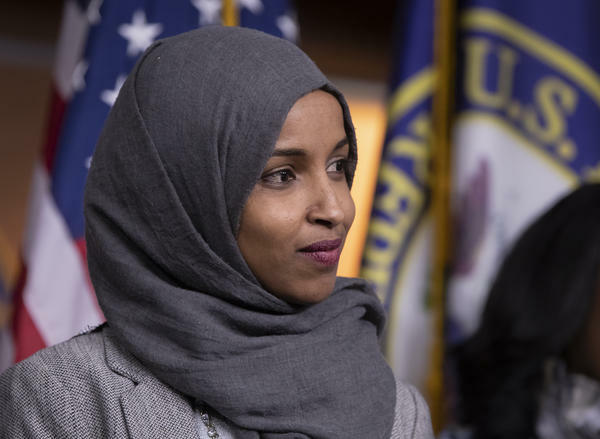 McCarthy did not offer specifics, but Republicans are considering options that include trying to force a vote on a resolution led Rep. Lee Zeldin, R-N.Y., that condemns anti-Semitism broadly and specifically calls out Omar. "We must speak out when any Member — Democrat or Republican — uses harmful tropes and stereotypes, levels accusations of dual loyalty, or makes reckless statements like those yesterday," the letter stated, a clear reference to Omar's tweets. Omar is one of the two first Muslim women to serve in Congress; the other is fellow freshman Rep. Rashida Tlaib, D-Mich.
For weeks, congressional Republicans have criticized Omar's placement on the House Foreign Affairs Committee and both women for what the Republicans see as anti-Semitic rhetoric in their past, but the letter was the first official act by some of their own Democratic colleagues. Another Democratic freshman lawmaker who is also Jewish, Max Rose of New York, criticized Omar for her tweets. "Congresswoman Omar's comments are deeply hurtful to Jews, including myself," he wrote. Other Democrats, including Chelsea Clinton, also tweeted criticism of Omar's rhetoric. Separately the Anti-Defamation League, an outside group formed to fight hate speech and anti-Semitism, also weighed in before Omar's apology, citing a tweet where she suggested politicians were being influenced by donations from Jewish groups. "As Americans and Jews, we expect our politicians to condemn bigotry, not to fuel it. Words matter. At a time when anti-Semitism is on the rise in the U.S. and abroad, Rep. Omar is promoting the ugly, anti-Semitic conspiracy theory that Jews have an outsized influence over politics," Jonathan A. Greenblatt, CEO and national director of the ADL, said in a written statement. House Democrats took the unusual step today of denouncing one of their own, freshman Congresswoman Ilhan Omar. The Minnesota Democrat is one of the first two Muslim women elected to serve in Congress. She's facing scrutiny for comments that both her allies and her critics consider anti-Semitic. In a statement today, House Speaker Nancy Pelosi and other top leaders asserted Democrats' support for Israel and pressured Omar to apologize. NPR's Susan Davis joins us from the Capitol. Hi there. SUSAN DAVIS, BYLINE: Hey there. KELLY: What prompted this rebuke from House Democratic leaders? DAVIS: So Congresswoman Omar is part of this young, really diverse freshman class of lawmakers who are really active and often very provocative on social media, particularly on Twitter. And over the weekend, on Sunday, she retweeted the journalist Glenn Greenwald. And Greenwald had been, in his tweet, attacking House Minority Leader Kevin McCarthy because he has, in the past, also criticized Omar. Now, Omar retweeted Greenwald with the comment, it's all about the Benjamins, baby. And when someone on Twitter responded to her and said, what do you mean by that, she just responded, AIPAC, which is of course the pro-Israel lobby here in Washington. These two comments combined were widely kind of viewed as playing on these tropes and conspiracy theories about Jewish money and influence in politics. And these comments were enough for House Democrats to really start joining in to condemn her comments and call for her to apologize. KELLY: And tell me more about those calls. How did this all unfold? DAVIS: So it started earlier in the morning, where two Jewish House Democrats, Josh Gottheimer of New Jersey and Elaine Luria of Virginia, they started circulating what's known as a Dear Colleague letter, asking other lawmakers to join them in asking their party leaders to condemn Omar's remarks. Other very prominent Democrats, people like House Foreign Affairs Chairman Eliot Engel, the House Ethics Committee chairman, Ted Deutch, also issued statements of their own condemning her tweets. Ultimately, Democratic leaders did point out a joint statement. It was led by House Speaker Nancy Pelosi and included the top five leaders in the House. The leaders reaffirmed their own support for the state of Israel. They also made the point that they support, in their words, legitimate criticism of Israel's policies. But they said Omar's language used anti-Semitic tropes and prejudicial accusations. And they called on her to apologize. KELLY: And do we expect her to apologize? How is she responding? DAVIS: She did apologize - again, on Twitter - as of this afternoon. In a statement, she acknowledged that anti-Semitism is real. She expressed gratitude for, quote, "Jewish allies and colleagues who are educating me on the painful history of anti-Semitic tropes." She added, "my intention is never to offend my constituents or Jewish Americans as a whole." She said she unequivocally apologizes for the remarks. However, in this exact statement, she did reiterate that she does plan to continue to speak up about what she called the problematic role of lobbyists in politics. That includes AIPAC. She also equated it with the NRA or the fossil fuel industry. She says it's gone on too long, and must - we must be willing to address it. This is a point that she and some of her defenders have been trying to make in this debate, that there is a distinction between criticizing the policies of the Israeli government and anti-Semitism. The political reality here is that she just hasn't done a very good job of making that distinction in her statements. And it wasn't good enough for Democrats. KELLY: So does the apology today do enough to quiet her critics and end this? Or are we likely to see this controversy continue to bubble along if she's going to keep speaking out about lobbyists, AIPAC and others? DAVIS: So even before these tweets over the weekend, she has been targeted by congressional Republicans who have been looking at past things she's tweeted, including a 2012 tweet - this is before she was elected to Congress - in which she had stated that, quote, "Israel hypnotized the world, may Allah awaken the people and help them see the evil doings of Israel." Republicans have done things like protest her assignment to the House Foreign Affairs Committee. And Minority Leader Kevin McCarthy said today that Republicans may still try to rebuke her on the House floor. They're considering a resolution that condemns anti-Semitism and her specifically. DAVIS: It's written by Lee Zeldin, who's one of two Jewish Republicans in the House. KELLY: That's NPR's Sue Davis. Thanks Sue. DAVIS: You're welcome. Transcript provided by NPR, Copyright NPR.